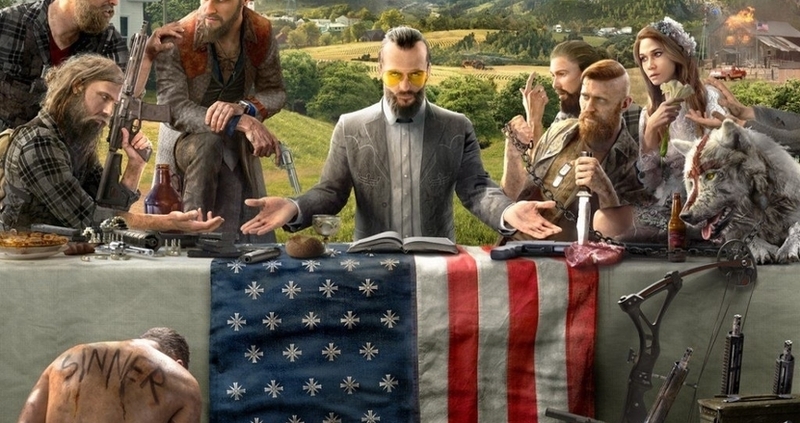 The Far Cry team unveiled the cover for the latest installment of their series, and there have already been assumptions made from the ctrl-left's spank bank. Some gaming journalists and extremely liberal gamers are praying that the game will be about killing redneck Republican Christians. That's totally acceptable and not a leftist's starter kit for fascism. Where do these people—who are just barrels of fun at parties—come up with the idea that this game will be about redneck Republican Christians or KKK white supremacists? Because there's American flags, it's based in America, there's possibly a Holy Bible, there's a bunch of rural white people, they're posing as if it's the Last Supper painting, and the current political climate in America for the ctrl-left is everyone right of Stalin is literally Hitler. As far as what the game is about, no one actually knows so it's all speculation. The real issue is that people extract what you put into something . They wanted to see Republicans, white supremacists, and Christians. But in all likelihood to follow the series from Far Cry 2 and so forth, the game will probably be about a cult similar to the Branch Davidians from Waco, Texas or the Jonestown Communists. In the previous entries of the series, you took on quests for scumbags and then finally conquered them with a militia of rebels. But that hasn't stopped ctrl-left "everything's political" nut jobs from expressing their hope that they can finally kill some Jesus lovin' redneck Trump supporters. Sorry. That would be President Trump. You can start on this NeoGAF thread and work your way below for some examples on Twitter. Remember, this isn't just any group of liberals doing this or Democrats. These are the polar opposite ctrl-leftists who are just as annoying as the real alt-right hoping for death. @pcgamer If trump, bannon, pence, or at least David duke cameo in the game then yes I'll be happy to test weapons on them. And just for giggles, here's popular feminist Anita Sarkeesian giving you an inside scoop on her knowledge of militias and their ties to white supremacy. Let's just ignore that militias are all over the world, not just in white dominant countries. And let's ignore that rebellious militias have been apart of the series since Far Cry 2. She knows that because she's a real gamer. You can Google people's takes on the cover. Personally, I believe it won't be a big deal just like the controversy with Far Cry 4's cover. They're going after cults it looks like. I know Ubisoft has some huge teams with different backgrounds including Christians. 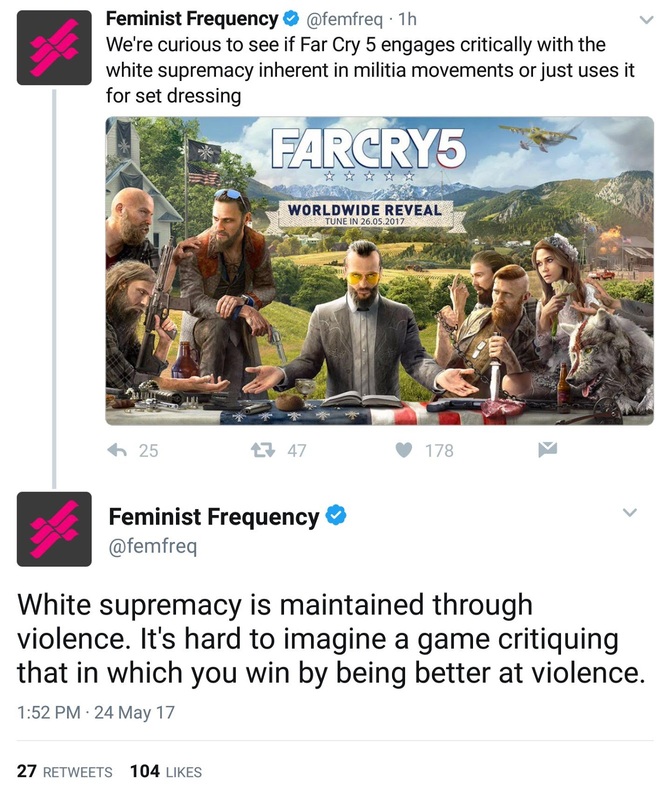 The ctrl-left just want something bad to come from it so they can justify their hate. And when they say "white supremacists", they mean anyone who supports President Trump. I'll wait and pass judgement and hope it's a crazy David Koresh situation you're dealing with rather than a SJW piece. Branch Davidians were from Axtell, Texas.